Hi guys! I'm a proud owner of a Husaberg FS570, i only have one issue. When driving my shoes and pants get in contact with the exhaust, aaaand its kinda hot.. Ill attach a picture with what I need. I suspect that the previous owner removed this..
Where can i get this, the carbon protector, and the frame protector? Sorry for my bad english. 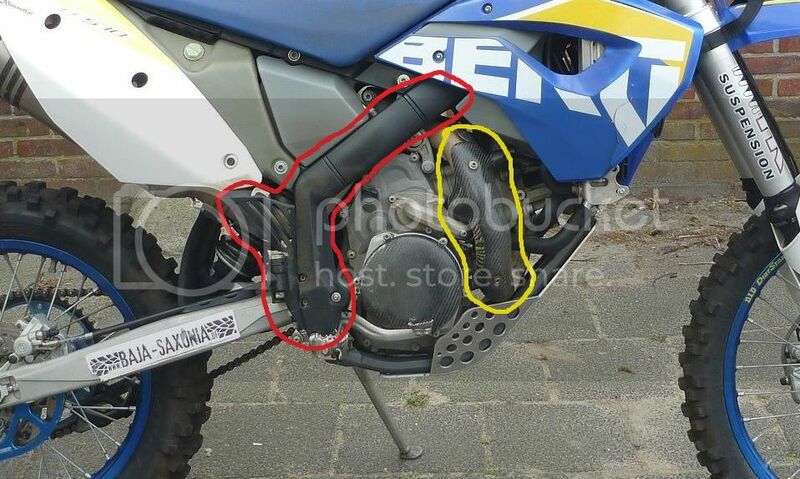 The frame protectors are from husaberg. The exhaust guard can be had from several places I got one from USA from pirie performance products which was very good. Thanks. I guess i'm not the only one with the heating problem. Those 4-strokes are really hot! Last edited by RRM707; January 28th, 2019 at 04:54 AM.